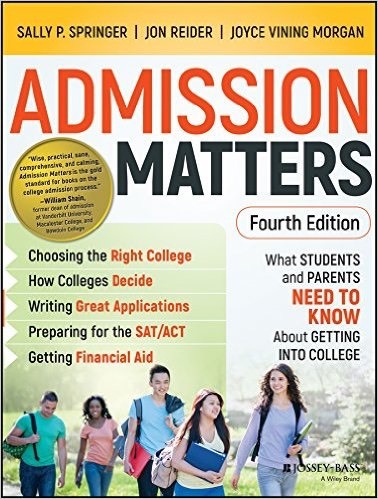 "Wise, practical, sane, comprehensive, and calming, Admission Matters is the gold standard for books on the college admission process." The resources listed here provide additional information on selected topics covered in Admission Matters. Some of it is “bonus” material such as concordance tables and special college lists. We’ve also chosen some web resources and a few books that you may find valuable, although we have not attempted to provide an exhaustive list since there is a lot of duplication of information. This list keeps changing as new materials appear and others become outdated or unavailable. Let us know if you have a resource you think we should include! The most recent SAT to ACT Concordance Table from the College Board may be found here in PDF form. A full set of concordance tables (Old SAT to New SAT, etc.) can be found at this link. www.collegeboard.org: College Board site that contains useful information about all aspects of college search and selection, as well as test preparation and registration. BigFuture can be accessed through this site or directly at www.bigfuture.org. www.nacacnet.org: Site of the National Association for College Admission Counseling, geared primarily to high school and college counselors, but with a section for students and parents with helpful information. www.princetonreview.com: Princeton Review site with a lot of free information about the college admissions process, including test preparation. The site also sells test preparation courses and materials. www.fairtest.org: Contains a list of more than 850 colleges and universities nationwide that admit a substantial number of students without regard to SAT or ACT scores. www.campustours.com: Site with links to virtual campus tours at hundreds of campuses. See the College Board BigFuture and Princeton Review sites in the previous section. Each contains detailed profiles of individual colleges as well as a search feature that identifies colleges meeting criteria entered by the user. http://nces.ed.gov/collegenavigator/: College Navigator sponsored by the US Department of Education. The site contains a database of thousands of schools that allows search by location, program, and degree offerings. www.usnews.com/education: Site provides free, limited access to the U.S. News database used to generate college rankings. Although we do not favor the use of these rankings, the data used to generate them can be helpful. The full database can be accessed for an annual fee. www.utexas.edu/world/univ/: Site provides links to the home pages of four-year colleges and universities throughout the United States. The links can be sorted by state or alphabetically. Barron’s Profile of American Colleges, by Barron’s Educational Series. Updated periodically but not annually. Contains profiles of over 1,650 four-year colleges that are rated according to degree of competitiveness. Includes free access to Barron's web-based college search engine. College Handbook, by the College Board. Updated annually. Contains profiles of all 3,800 four-year and two-year colleges in the United States. Tables show policies and outcomes for early decision, early action, and wait list applicants. The College Finder, by Steven Antonoff. (Westford, MA: Wintergreen Orchard House, 2017): Helpful lists of recommended programs by major, sport, and many other categories. Many of these lists can also be accessed at www.collegexpress.com. www.ctcl.org: Site that originated with Colleges That Change Lives by Loren Pope but that has expanded to include a few other institutions as well. Contains lots of good information about college selection. www.collegeprowler.com: Student-generated evaluations of colleges. Colleges That Change Lives: 40 Schools That Will Change the Way You Think About Colleges, by Loren Pope and Hilary Masell Oswald (New York: Penguin Books, 2012): Descriptions of 40 lesser-known but excellent liberal arts colleges. Fiske Guide to Colleges, by Edward Fiske (Napierville, IL: Sourcebooks, 2017): Updated annually. Contains profiles and personal descriptions of more than 320 popular colleges and universities. These are best viewed as a window into the admissions process at highly selective institutions rather than as a how-to guide to gain admission to them. The Gatekeepers: Inside the Admissions Process of a Premier College, by Jacques Steinberg (New York: Penguin, 2003): Describes the author’s experience observing an admissions cycle at Wesleyan University. Creating a Class: College Admissions and the Education of Elites, by Mitchell Stevens (Cambridge, MA: Harvard University Press, 2009): Describes the author’s experience observing the admissions process at Hamilton College. www.ajcunet.edu: Site sponsored by Jesuit colleges. www.hillel.org: Site of Hillel, the Foundation for Jewish Campus Life. www.womenscolleges.org: Official site of the Women’s Colleges Coalition. www.usafa.af.mil: Site of U.S. Air Force Academy. www.usma.edu: Site of U.S. Military Academy (West Point). www.usna.edu: Site of U.S. Naval Academy. www.usmma.edu: Site of U.S. Merchant Marine Academy. www.cga.edu: Site of U.S. Coast Guard Academy. African American Student's College Guide: Your One-Stop Resource for Choosing the Right College, Getting in, and Paying the Bill by Isaac Black (Hoboken, NJ: Wiley, 2000): Advice for African American students. Native American Students — Information specific to Native American students may be found here. www.collegeboard.org: Information and preparation for the PSAT and SAT. The site can be used for online test registration for the SAT. www.ACT.org: Information and preparation for the PLAN and ACT. The site can be used for online test registration for the ACT. www.ets.org: Information and preparation for the TOEFL (Test of English as a Foreign Language). The site can be used for online test registration for the TOEFL. www.ielts.org: Information and preparation for the IELTS (International English Language Testing System). The site provides a downloadable registration form and instructions for registering for the IELTS. The Official SAT Study Guide, by the College Board (Princeton, NJ College Board, 2016): Official test preparation guide to the SAT. The Official ACT Prep Guide, (San Francisco: JosseyBass, 2017): Official test preparation guide to the ACT. On Writing the College Application Essay, 25th Anniversary Edition: The Key to Acceptance at the College of Your Choice, by Henry Bauld (New York: Collins Reference, 2012): A former Ivy League admissions officer provides tough and funny advice on coming up with the best essay possible. The College Application Essay: Sixth Edition, by Sarah Myers McGinty (Princeton, NJ: College Board, 2015): Contains excellent, easy-to-follow advice on writing effective college application essays. www.npda.edu: Site of the National Portfolio Day Association, a group of accredited arts colleges and university art departments that are members of the National Association of Schools of Art and Design. College Guide for Performing Arts Majors: The Read-World Admission Guide for Dance, Music, and Theater Majors, by Carole J. Everett (Albany, NY: Peterson’s, 2009): Guide to programs in music, arts, theater, and dance. College Guide for Visual Arts Majors, by Peterson's and Sandra Reed (Albany, NY: Peterson’s, 2009): Guide to programs in fine arts, graphic design, architecture, media arts, or any of the many other art disciplines. Creative Colleges: A Guide for Student Actors, Artists, Dancers, Musicians and Writers, by Elaina Loveland (Belmont, CA: Supercollege, 2010): Contains profiles of more than 200 art, drama, dance, music, and creative writing programs. www.ncaa.org: Website of the National Collegiate Athletic Association. A must-read for those interested in varsity athletics at colleges and universities that belong to the NCAA. www.naia.org: Website of the National Association of Intercollegiate Athletics. Important for those interested in varsity athletics at colleges and universities that belong to the NAIA. Reclaiming the Game: College Sports and Educational Values, by William Bowen, Sarah Levin, James Shulman, and Colin Campbell (Princeton, NJ: Princeton University Press, 2005): Analysis of the role of athletics in the admissions processes at Ivy League and selective liberal arts colleges. The Student Athlete's Guide to Getting Recruited: How to Win Scholarships, Attract Colleges and Excel as an Athlete, by Stewart Brown (Belmont, CA: Supercollege, 2011): Guidance on choosing an NCAA division and handling the recruitment process. www.E4FC.org: Site of Educators for Fair Consideration. Provides information for undocumented students. www.nilc.org: Site of the National Immigration Law Center. Provides information for students concerned about immigration status. K&W Guide to Colleges for Students with Learning Disabilities or Attention Deficit Hyperactivity Disorder, 13th ed., by Marybeth Kravets and Imy Wax (New York: Princeton Review, 2016): Profiles the services for learning disabled students at over 300 colleges. Life After High School, by Susan Yellin and Christina Cacioppo Bertsch (Philadelphia: Jessica Kingsley Publishers, 2010): Offers advice and support to students with disabilities and their families, before and during the transition to life after high school. And What About College? How Homeschooling Leads to Admissions to the Best Colleges and Universities, by Cafi Cohen (New York: Holt Associates, 2000): Resource for homeschooled students about the college search and the documentation they need in the application process. www.bigfuture.org: Site (click on Pay for College) for information on the FAFSA, CSS PROFILE, net price calculators, and expected family contribution calculators. www.fafsa.ed.gov: Federal site for FAFSA (Free Application for Federal Student Aid). If you are applying for need-based aid, visit this site. You can complete the FAFSA online. www.fafsa4caster.ed.gov: Federal site that lets families get estimates of their expected family contribution without actually submitting the FAFSA. www.fastweb.com: General site with terrific scholarship search, as well as expected family contribution calculator. www.finaid.org: General site with lots of information about all aspects of financial aid. http://studentaid.ed.gov: Comprehensive government site with information in English and Spanish. www.fastweb.com: Scholarship search website. Also available as an app for smart phones. Scholarship Handbook 2017 (College Board Scholarship Handbook), by the College Board (Princeton, NJ: College Board, 2016): Provides information on private, federal, and state funding sources of financial aid. Getting Financial Aid 2017 (College Board Guide to Getting Financial Aid), by the College Board (Princeton, NJ: College Board, 2016): Advice on all aspects of the financial aid process. Secrets to Winning a Scholarship, by Mark Kantrowitz (CreateSpace Independent Publishing Platform, 2011): Advice on finding and applying for private scholarships. www.foldsofhonor.org/resources/scholarships/ Scholarships for spouses and children of disabled or deceased service members. www.nafsa.org/Explore_International_Education/For_Students/: Site of the Association of International Educators with pages for US students studying abroad and international students studying in the United States, including resources for financial aid. www.edupass.org: Site for international students that calls itself “The Smart Student Guide to Studying in the U.S.A.” Provides information on every topic about studying and living in the United States. International Student Handbook 2017 by the College Board (Princeton, NJ: College Board, 2016): Information on 2900 colleges, including TOEFL requirements, financial aid, housing availability, and other services. Learn in the United States: The International Student's Guide for Applying to American Colleges, by Ryan Byrne and Gayle Byrne (Kindle, 2011) (electronic version only): Guide to understanding the total international student application process from exploring the US educational system to securing a visa. The Complete Guide to the Gap Year: The Best Things to Do Between High School and College, by Kristin M. White (San Francisco: Jossey-Bass, 2009): Comprehensive guide to 200 gap year programs. www.interimprograms.com: Site for the Center for Interim Programs gap year counseling service. Contains helpful, free articles. www.aucc.ca: The official website of the Association of Universities and Colleges of Canada, in English and French. Links to all Canadian universities, programs of study, and information about tuition, enrollment, job trends, and quality assurance. www.ucas.ac.uk: The basic guide and application site universities in the United Kingdom. Provides information on majors and applying, with advice for students, parents, and counselors. www.iua.ie: Website of the Irish Universities Association, with links to the seven major Irish universities. Information about courses, application processes, visas, quality assurance, and accommodation. Times Good University Guide, by The Times (New York: HarperCollins, updated annually). Available for purchase at amazon.com. Authoritative guide to higher education programs at all universities in the United Kingdom.